Bicycles have been a part of my life for as long as I can remember. My first bike was a Murray 1000 BMX bike that my parents won in a contest while I was an infant. Later I had an unusual square tube bike with metallic green flake paint – I want to say it was a Huffy but cannot remember for certain. In the 1990s I had a beautiful dark blue Dyno VFR that we bought from a neighbor. Some time later when it was stolen from our backyard, my mom bought me a 1998 Dyno NSX from the bike shop. 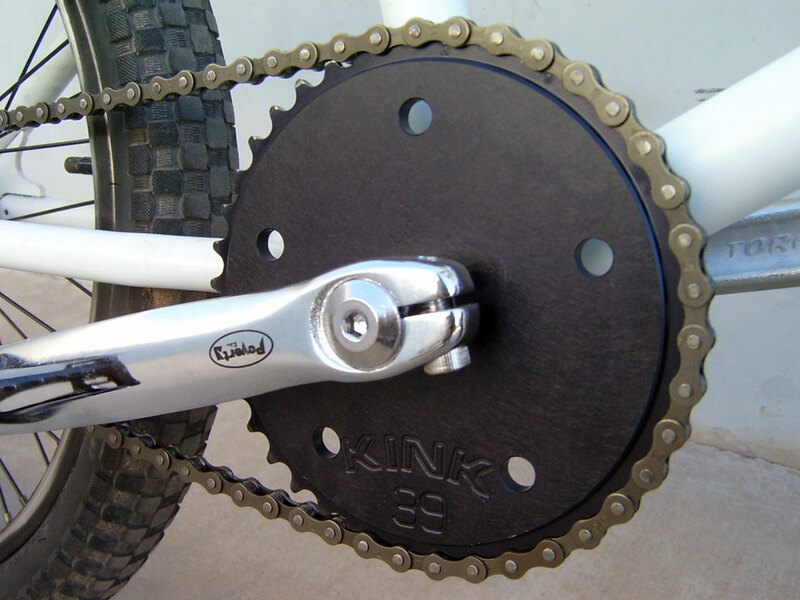 Throughout my childhood, I owned low end bikes with one-piece cranks, caliper brakes, and steel frames. I only had BMX style bikes – that was all I knew. My knowledge of BMX was pretty much limited to magazines like rideBMX and BMX Plus! that I would read at the grocery store while my mom did the shopping. 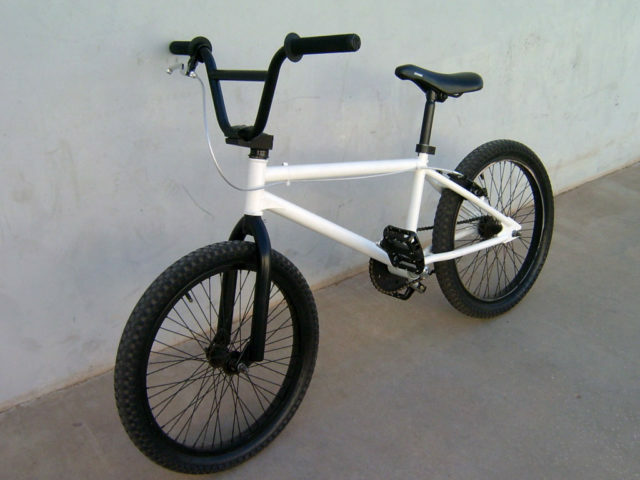 I lusted after brands like GT, Dyno, Haro, Mongoose, Powerlite, Redline, and Free Agent. I dreamed that one day I would own a “real” BMX bike. Well high school came and went and I never got good at BMX, though I continued to ride for fun. 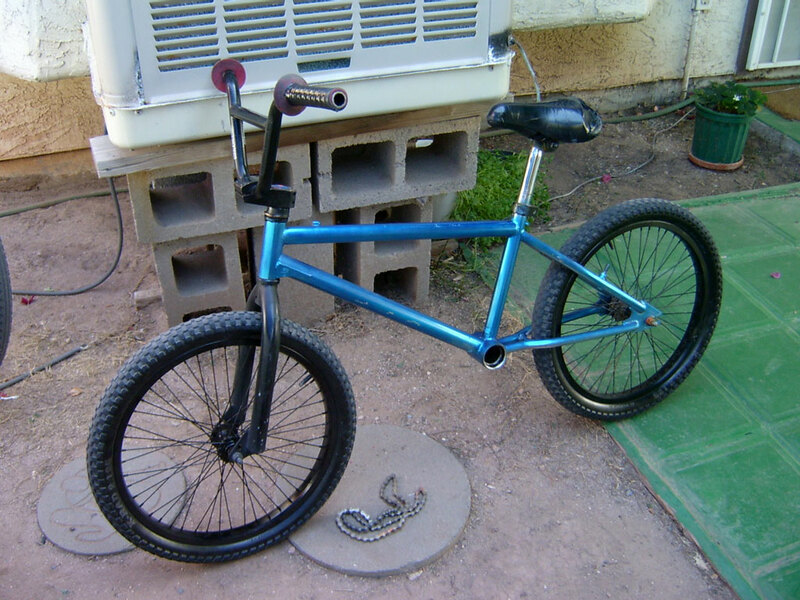 In 2006, I was 20 years old and in community college when I found a stripped out BMX frame in a trash bin. I decided that this was an opportunity to build the nice bike I had always wanted. Now, this was right around the time that I would say the modern BMX era was just getting its start. 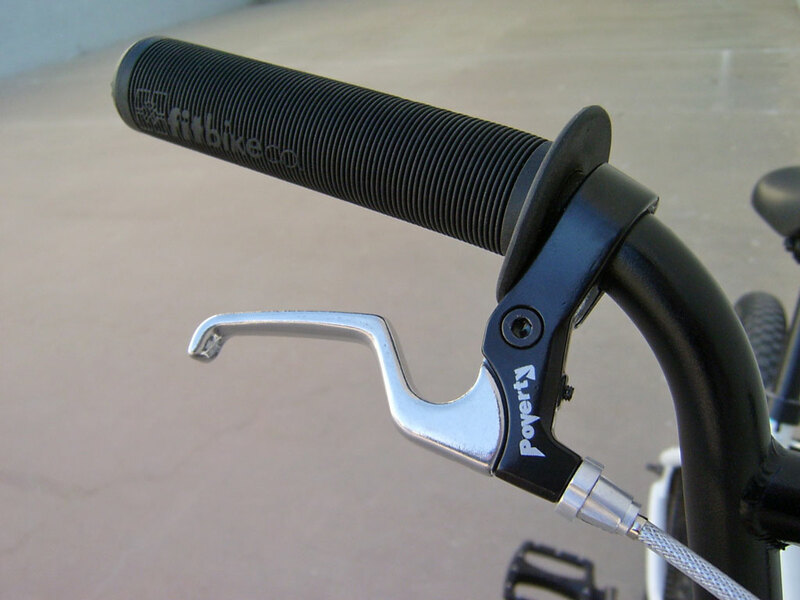 Brands like Fit Bike Co., Animal, Volume, Mutiny, WeThePeople, and Federal bikes had only been around for a few years at this point. 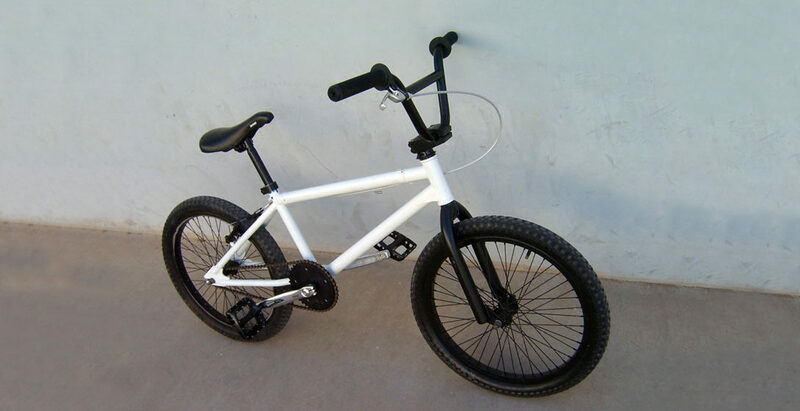 New companies and brands were popping up left and right – Stolen bikes was founded in 2003 followed by Subrosa in 2004 and Sunday! in 2005. Not long after, CULT was founded in 2009 and KINK came along in 2010. By “modern era” I mean BMX bikes that have lightweight alloy/composite frames, linear pull brakes (or no brakes at all), really low seat posts, and tiny chainwheels. 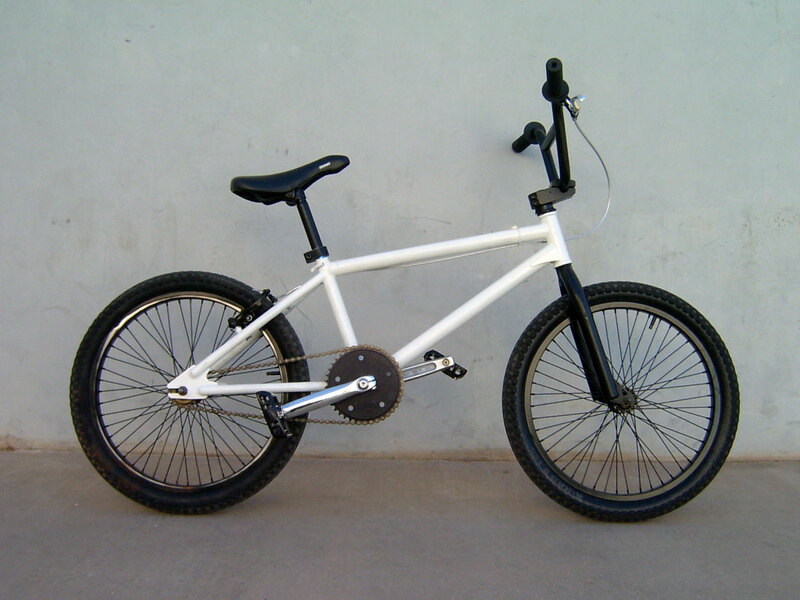 However, I only had knowledge of the 1990s BMX scene when I began building this Redline bike in 2006. As I mentioned, I found the bike in a trash bin. 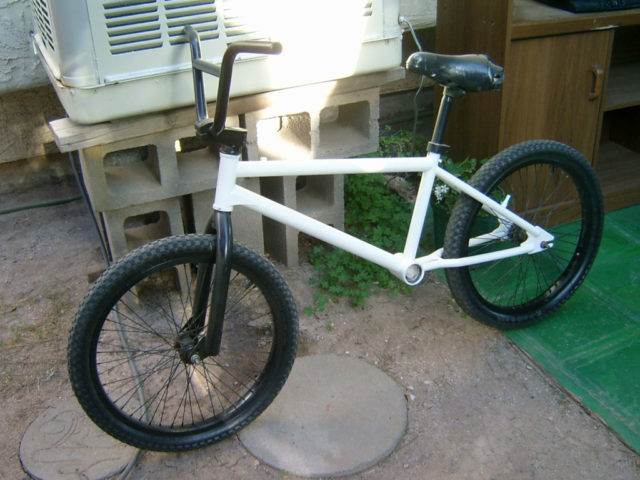 It had a Redline frame with Haro forks and bars, a Fusion headset, and cheap wheels with Kenda K-Rad tires. 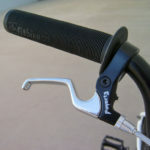 There were no cranks, the grips were worn smooth, and the seat was covered in electrical tape. It was certainly a project, but I was determined to fix the bike up as best as I could. The first decision I had to make was color: I was not feeling the blue chrome and orange spray paint that was on the bike when I got it. After much thought, I decided to stick with a simple black and white color scheme. I removed the wheels, grips, and seat and started sanding. The old paint came off easily with ordinary sandpaper. I started with 100 grit and then moved up to 220 grit. After a few nights of sanding, the bike was ready for a new coat of paint. 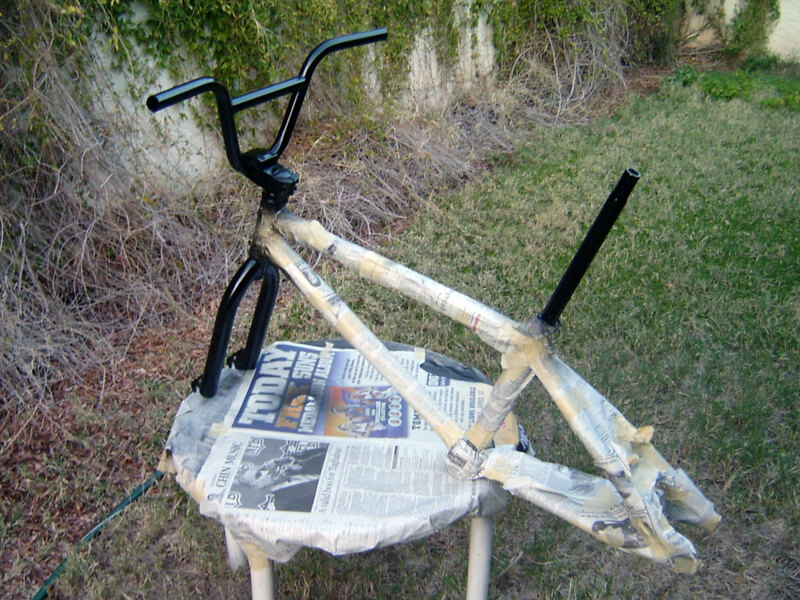 Probably the hardest part of this project was painting the bike. I wanted it to be as glossy and perfect as possible. I masked it off and painted it in my parents backyard using the cheapest brand of spray paint from the hardware store. I used a few cans of gloss white, gloss black, and lots of clear coat. There are one or two rough spots up close, but from a few feet away, I thought it looked pretty great! I was very excited when the box of parts arrived! 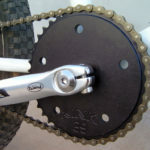 However, I did not have the tools or experience to actually assemble the cranks, brakes, etc. For most people this would have been a great learning experience, but I dodged it. I brought everything to a local bike shop and they did it all for me. In just a couple of days, the shop installed the cranks, pedals, chainwheel, and put the brakes together. My total out the door was $64 and included a brake cable which I had forgotten to order. 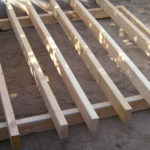 When I picked it up from the shop, everything felt very strong and durable. The ride was smooth and quiet and the brakes worked beautifully. This bike doesn’t even compare to the high strength, modern BMX bikes of today. I wasn’t trying to do a vintage BMX build, either – I was just doing what I thought was right, despite my lack of experience. I remember being very proud of the bike and the satisfaction of seeing this junker that someone had given up on transformed into something usable once again. I still have the bike and keep it in good condition. Originally Published: May 20, 2006. Revised: November 6, 2009; July 27, 2018.